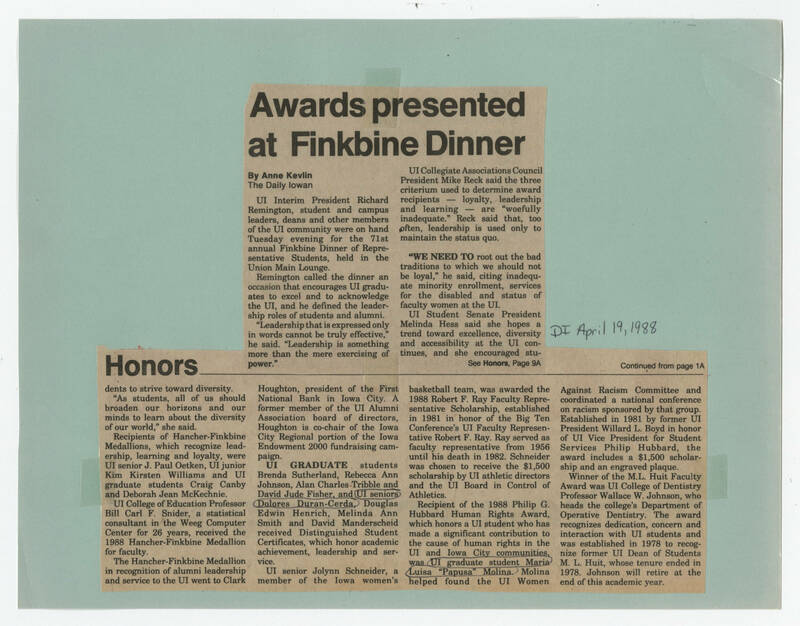 [[Handwriting]] DI April 19, 1988 [[Header]] Awards presented at Finkbine Dinner [[end header]] [[bold]] By Anne Kevlin [[end bold]] The Daily Iowan [[Article text]] UI Interim President Richard Remington, student and campus leaders, deans and other members of the UI community were on hand Tuesday evening for the 71st annual Finkbine Dinner of Representative Students held in the Union Main Lounge. Remington called the dinner an occasion that encourages I graduates to excel and to acknowledge the UI, and he defined the leadership roles of students and alumni. "Leadership that is expressed only in words cannot be truly effective," he said. "leadership is something more than the mere exercising of [[bold]]power. "[[end bold]] UI Collegiate Associations council President Mike Reck said the three criterium used to determine award recipients -- loyalty, leadership and learning -- are "woefully inadequate." Reck said that, too often, leadership is used only to maintain the status quo. [[bold]]"WE NEED TO[[end bold]] root out the bad traditions to which we should not be loyal," he said, citing inadequate minority enrollment, services for the disabled and status of faculty women at the UI. UI Student Senate President Melinda Hess said she hopes a trend toward excellence, diversity and accessibility at the UI continues, and she encouraged stu- See [[bold]]Honors, Page 9A] [[header]] Honors [[end header]] Continued from page 1A [[Article text]] dents to strive toward diversity. "As students, all of us should broaden our horizons and our minds to learn about the diversity of our world," she said. Recipients of Hancher-Finkbine Medallions, which recognize leadership, learning and loyalty, were UI senior J. Paul Oetken, UI junior Kim Kirsten Williams and UI graduate students Craig Canby and Deborah Jean McKechnie. UI College of Education professor Bill Carl F. Snider, a statistical consultant in the Weeg Computer Center for 26 years, received the 1988 Hancher-Finkbine Medallion for faculty. The Hancher-Finkbine Medallion in recognition of alumni leadership and service to the UI went to Clark Houghton, president of the First national Bank in Iowa City. A former member of the UI Alumni Association board of directors, Houghton is co-chair of the Iowa city Regional portion of the Iowa Endowment 2000 fundraising campaign. [[bold]]UI GRADUATE[[end bold]] students Brenda Sutherland, Rebecca Ann Johnson, Alan Charles Tribble and David Jude Fischer, and UI seniors Delores Duran-Cerda, Douglas Edwin Henrich, Melinda Ann Smith and David Manderscheid received Distinguished Student Certificates, which honor academic achievement, leadership and service. UI senior Jolynn Schneider, a member of the Iowa women's basketball team, was awarded the 1988 Robert F. Ray Faculty Representative Scholarship, established in 1981 in honor of the Big Ten Conference's UI Faculty Representative Robert F. Ray. Ray served as faculty representative from 1956 until his death in 1982. Schneider was chosen to receive the $1,500 scholarship by UI athletic directors and the UI board in Control of Athletics. Recipient of the 1988 Philip G. Hubbard Human Rights Award, which honors a UI student who has made a significant contribution to the cause of human rights in the UI and Iowa City communities was UI graduate student maria Luisa "Papusa" Molina. Molina helped found the UI Women Against Racism Committee and coordinated a national conference on racism sponsored by that group. Established in 1981 by former UI President Willard L. Boyd in honor of UI Vice President for Student Services Philip Hubbard, the award includes a $1,500 scholarship and an engraved plaque. Winner of the M.L. Huit Faculty award was UI College of Dentistry Professor Wallace W. Johnson, who heads the college's department of Operative Dentistry. The award recognizes dedication, concern and interaction with UI students and was established in 1978 to recognize former UI Dean of Students M. L. Huit, whose tenure ended in 1978. Johnson will retire at the end of this academic year.